Winter at Passo del Tonale is a special season: a fairy-tale landscape, perfectly groomed ski slopes, modern ski lifts, sun, snow and fun… these will be the ingredients of your holiday in Trentino, at Alpencolor Tonale Hotel. 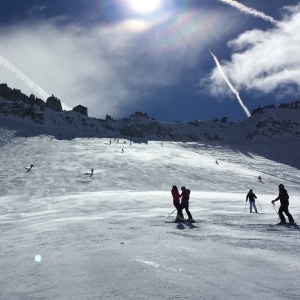 The Adamello Ski area, an excellent winter ski resort, has always guaranteed a very long season in the snow, with ski slopes and trails for experts and beginners. Skiing, snowboarding, hiking in the snow, snowshoe tours and adventurous ski-mountaineering trips… at Passo del Tonale, you will find everything you need for a memorable holiday in the snow. During the week, the Tonalevolution ski school is at our hotel to present the courses and activities it organises locally. Every Sunday afternoon, our guests can ski with a ski instructor from the Tonalevolution ski school, who will guide them to discover the fantastic Tonale-Ponte di Legno ski area. Come and spend your winter holiday in the snow in Trentino. The staff at Alpencolor Tonale Hotel will be happy to welcome you with our typical warm hospitality, offering you all the best for a holiday in the snow.